Here is a scrubbie that is soft enough to shower and wash your face with and still tough enough to clean dirty pots and pans. I wouldn’t recommend using it for all of these at one time, so be sure to make enough to go around. No matter if you are a beginner or an advanced crocheter here is a pattern you can enjoy. It doesn’t take much yarn and can be whipped up fairly quickly. For extra scrubbing power, add some nylon netting. With a yarn needle, sew two circles together. Using photo as a guide, sew strap to scrubbie with a yarn needle. If you needle help with this pattern, let me know by leaving a comment! This entry was posted on Wednesday, May 6th, 2009 at 1:05 AM by Rachel Choi	and is filed under Free Crochet Patterns. You can follow any responses to this entry through the RSS 2.0 feed. You can leave a response, or trackback from your own site. I came across your site by accident looking for a good pattern for baby booties that I was going to get my Grandma to translate for me (all of the little codes might as well be another language for me). I found the listing of abbreviations so helpful. They must seem like insignificant details to regular crocheters because I could not find them anywhere else until I came to this site. Thank you for taking the time to share your creations !! I’ve never used a place marker. Can you explan the purpose as it relates to this pattern? A place marker helps you keep track of where one round ends and the next begins. You can use a piece of scrap yarn and put it into the stitch. More info on using place markers in crochet can be found in a post a wrote a while back. It’s in example 2 at the bottom. This is a great idea!! I’m going to whip up a couple and use them on my dishes tonight….thanks!! a good idea would be to only sew the pieces halfway together and then attach a button or something so that u could use it in the shower and put a soap bar in it or something. Thanks for the pattern!!!!!!!!!!!!!!!!!! I made mini versions of your pattern and only one circle and use them to wash my chickens eggs. After each round should it be joined with a slip stitch? There is nothing that says to join and I’ve made it to row 3 and its a half circle. I’m new to crochet. Deidre, the pattern in crocheted in the round like a spiral. There’s no need to join with a slip stitch. After each round don’t turn your work, simple continue to crochet in a circular fashion. Let me know if you need more help! Do you mean to crochet the netting into the yarn? Any tips on how to do that? Thx! Marlene, yes you can crochet with the netting. To do so, try cutting thin strips of the netting and hold it along with your yarn as you crochet. I live in Sweden and am not sure what you mean by nylon netting. Please explain! Hi Gail! It is similar to tulle, the material used to make tutus or the bottom of fluffy dresses. Nylon netting has slightly wider holes in it compared to tulle and are both usually sold next to each other in fabric stores. You can use either one! may i make some of these to sell? trying to raise money to go to prom. Yes, all finished crocheted items that you make from any Crochet Spot pattern may be sold. Good luck with your sales! I have found thee for sale from time to time and lately can not find them. Do any of you gals sell them and for how much? I really like these, but have no time to do this even if I crocheted, which I do not. Help. the Scrubbie works very goood! where can you get netting from? i can use this for face, yes? Yes, it is the tulle. You can use any cotton yarn, some people even like to use acrylic yarn. I’ve made them with just yarn, just netting, and some with both held together. Feel free to try it out to see what you prefer! I have made the scrubbies before but do not remember how much nylon netting to buy? HELP! When you put your netting strips together, you’ll need about the same amount as if you were using regular yarn. This pattern calls for about 30 yards. So you can buy a yard of netting and cut it into the strips until you have about 30 yards worth. just finished making one circle with peaches &cream yarn & one with netting then slip stitched them together. looks good. thanks for the idea..
Where is pattern for dish scrubber in picture? The pattern for the scrubber is right underneath the picture. Scroll down and you’ll see it. Hello! You can cut the netting about 1″ wide and use the hook that is suggested in the pattern, or a slightly larger hook if you find it’s too tight. the pattern and picture given here is not the same as the picture of the twirly, two-colored scrubbie I clicked on. No matter whose page its pinned on, it’s the same picture I click on, and this pattern of the two plain circles comes up. How do I get the twirly, two-colored scrubbie in the original pinned picture? It is not on this page. 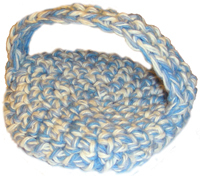 This pattern on this page is for the scrubbie that is pictured here (blue and white). It uses a yarn that has 2 colors in it so it gives the multicolored look. If you use a solid colored yarn you’ll get a solid colored scrubbie. Just made this using Red Heart Scrubby yarn. Turned out really cute! I added an extra row because I wanted it a little bigger. I also found that you can avoid sewing them together if you slip stitch around. Then you can just chain the handle, slip stitch to the other side (I did it in 2 places to make it more sturdy), sc back across the handle and slip stitch again to join! Very easy! That’s awesome! I haven’t tried the Red Heart Scrubby yarn yet, but have seem it in stores. Let me know how much scrubbie power it has. I’ll have to try it! LOL, the scrubby yarn is great, but the best is look carefully at all the washing instructions on the packaging both inside and out. Somebody was REALLY confused and has a TOTAL disconnect as to what I do with my dishcloths! How do the dish Scrubbies stand up to machine washing & drying? Dear Ms. Choi: I do not understand the Row 1 when you say to make two chains and place 6 single crochets in the second chain. Do I not join the chains in a circle, and how do you keep track of the rows. I also do not know how to finish off the pattern. When it says to finish off, you will simply cut the yarn then weave in the end into your work to hide it. Let me know if you need more help with it! I see tutorial on how to embroider eyes….on Pacifer Animals, not sure how to embroider snout/nose, and smile. Did a search and didn’t find anything. Please help! Hi Jane! The nose and mouth can be done in a similar manner. You can adjust the shape by inserting your hook into different stitches. The mouth is usually done with a single “line” in the direction that you want it to be. You will sew the two circles together with a yarn needle. Place one on top of the other and sew around the edge.